Mercury dime values start at $1.24 each. 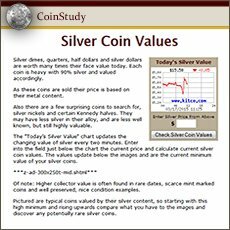 With silver at $14.90 an ounce, all silver dimes have this minimum value. Find one minted in the early years, 1916-1930 and the value often rises to $1.50 each, with many having a value of $13 to $35 or more, in very nice condition. Discover a rare date in your group, such as the 1926-S, even in heavily worn condition it is worth $10. Hopefully the 1926-S you find is in "Extremely Fine" condition and now a $210 coin. 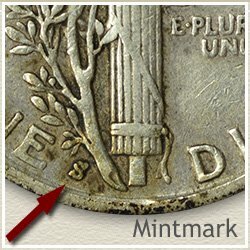 Rare dates and mint marks are two key factors affecting Mercury dime values. Also, the condition of your coins is important in determining how much your Mercury Dime is worth. A nice mint state Mercury dime pictured, because of its beautiful condition is worth $20 and perhaps higher. The following chart clearly shows the wide range in values. From $1.24 to hundreds, depending on dates, mint marks and condition. The above are wholesale Mercury dime values. Computed from dealer's price lists with various mark-up factors figured in. They reflect closely the value you would expect to receive when selling. Special Note: Mercury dimes dated 1940-1945 are generally collected in Uncirculated grade. The values normally range from $5 to $30 depending on how nice the uncirculated condition. The fewer marks, brightness of luster, beauty of toning, fullness of strike all have a role in determining Mercury dime values. Mercury Dime values are tied directly to their condition. Whether a rare date or a common one, values rise with rising condition. Collectors want the nicest for their collections and are willing to pay a premium for high condition coins. Compare your coins to the grading images below, find the closest match and assign each of your coins a "Grade". Grading a coin is straight forward, as a coin circulates, elements of the design wear and disappear. Each stage is assigned a grade. Examine closely the Fasces on the reverse. All vertical lines showing separate a coin in Fine condition from one in Very Good condition where some lines are worn smooth and not separated. Very nice coins are crisp and sharp in all the details and have a grade of Extremely Fine. It is important to understand Mercury dime values rise sharply if the coin is Uncirculated. Meaning showing no signs of wear. Sometimes difficult to determine if your coin is toned. Judging the condition of your old dime is covered in detail. 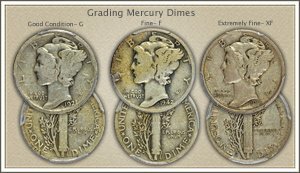 Visit: Grading Mercury Dimes | Video demonstrates a step by step process to judge condition and assign a grade. Video proceeds through grading dimes in various states of wear and conditions. Detailed descriptions and close up images highlight the standards used to confirm each grade. It is helpful to know grading a coin is not an exact science. It is your opinion, dealers and collectors have their own opinions... and they can all differ slightly. 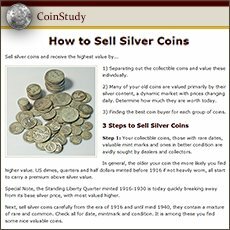 Coin dealer and auction listings are very useful. Look for these offering Mercury Dimes for sale, their listings and prices usually include a notation of the NGC and PCGS assigned grade. Additionally... these coin dealers are potential buyers of your coins. 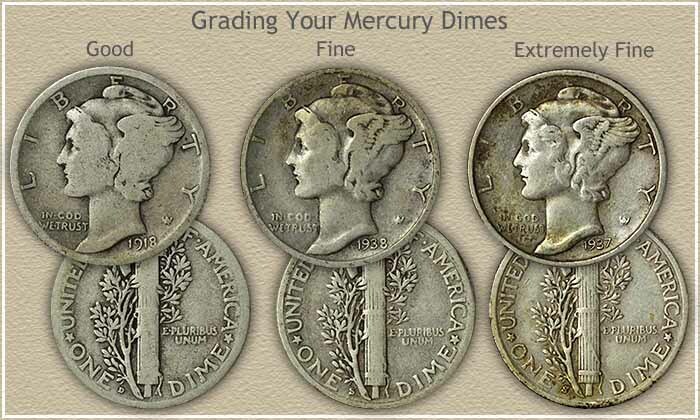 Accurately determining your Mercury dime values involves the date, condition, and the mint that produced the coin. A Mintmark was used indicating which branch mint produced the coin. An "S" for the San Francisco mint, and a "D" used by the Denver Mint. The main mint in Philadelphia also struck Mercury dimes, but at the time did not place a mintmark on coins. Locate the mintmark on the reverse, along the rim at the bottom, at the left side. Mercury dimes, once you get to know them are an interesting series to collect. Consider your group of coins as the beginning of a coin collection. 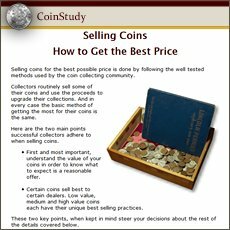 If that is not for you and you don't become a collector, one successful approach is to sell all of your coins and use the proceeds to buy one nice rare coin. The one you were hoping to find in the box. Pass the thrill of a "rare" coin on to your children. Five dates steal the show. Firstly the 1916-D is considered the key to the series and the one lacking from most collections. This coin has been valuable for decades, $524 in Good condition today. The 1921 and 1921-D, $42 to $52 in Good condition, rising to over $91 and $159 in Fine condition. Followed by the 1926-S with a minimum value in Good condition of $10. The fact these coins were overlooked and circulated long enough for some to show signs of heavy wear indicates you have a chance to find one in your box of old coins. Collectors of Mercury dimes value a coin based on condition. Grading a coin is key. How to video demonstrates the grading process, detailed descriptions of the key elements to grade are highlighted with images. Determine an accurate grade and value of your old dime. Print the Coin Values Worksheet - link in navigation column - to list your Mercury dime values. Should you decide to sell... use the worksheet as an invoice and packing slip when sending coins through the mail to dealers. It indicates you have done your coin values homework.